Tencel and polyester. Polyester fabric is characterized by abrasion resistance, which is not easy to shrink and difficult to wrinkle. However, it will have the characteristics of impermeability, strong affinity for oil, and easy and coarse adsorption of dust when made into clothes. when interwoven with Tencel polyester fabrics, the characteristics of tencel polyester blends fabrics will be perfectly improved.The manufacturing process of the Tencel fabric and polyester alleviates greatly the deficiency between the two, making the advantages of the both more prominent. 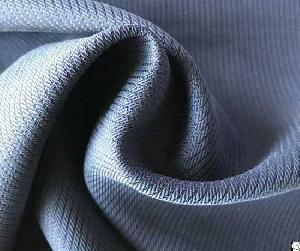 Tencel polyester fabric is elastic in both wet and dry conditions with good abrasion resistance as well. In addition, its condensation rate is relatively small and it is not easy to wrinkle. It's featured by uprightness and softness. It is softer in the vertical direction which has higher strength. Many businesses in the market are using Tencel polyester fabrics to make lady dresses like "transverse line" dresses and pleated dresses with light weight. In addition, they are not easy to wrinkle, avoiding unnecessary embarrassments. Tencel polyester fabrics are also divided into two kinds of elasticity and non-elastic ones, with the former usually used to make sportswear or casual clothing.